Wireless charging bracket is a smart charging product integrating wireless charger and mobile phone bracket. The design is generous and simple. 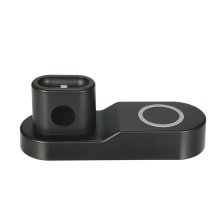 It is compatible with i-phone, i-watch, airpods and i-pad with Oi standard. Solid and elegant, organizes your devices ideally. Start every wonderful day with "100% charged". Charge vertically for phone calls. Wide compatibility: i-phone, i-watch, airpods and i-pad. The main body is made of aluminum alloy, while the bottom is provided with anti-skid silicone pad which provides you sturdy stand.